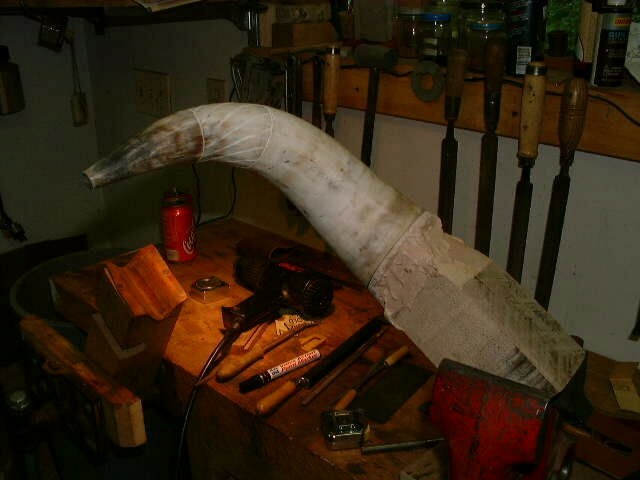 I recently wanted to clean up a new horn and remembered how difficult it was to hold one down while I cleaned, shaped and scrimshawed on it. I've heard several horror stories and various opinions how to do this using shot bags of leather to hold the horn steady. Not having any shot bags handy, I looked around the shop for another solution. I spotted my quart can of Bondo on the shelf. I use Bondo a lot for holding down side plates, lock plates and other furniture while I clean them up and shape them. I know it works well; and with a little heat, the part releases quickly and cleanly. 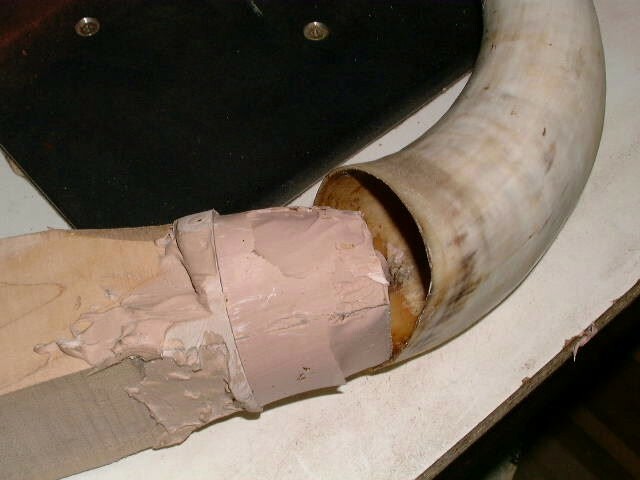 So, I mixed a batch of Bondo, buttered up the end of a piece of scrap wood and shoved the horn on about 2 inches. Then I set it aside overnight to set. A week later, I took the horn to the NMLRA Spring shoot in Friendship and parked it in a bench vise while I worked on it. The Bondo held great. I was able to position the horn any way I needed to for scraping and shaping. When I returned home, I put my heat gun on the horn to warm it up, and it popped right off of the Bondo matrix without a bit of trouble. This article is Copyright 2002 by Jerry Crawford and is published with the permission of the author .